The following piece, with a selection from the collection of photos, is published in the 2017 issue of con’text. Costa Rica: The name conjures images of rich dense vegetation spilling down hills to pristine beaches, but these landscapes are threatened. 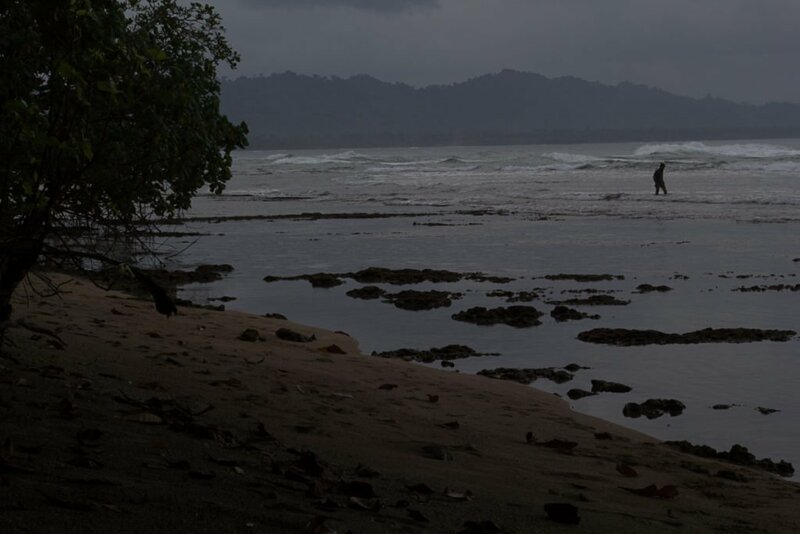 With nearly a thousand miles of coastline, Costa Rica faces loss of land from rising ocean levels. Inland, where the volcanic spine of the nation spills down toward the coasts, land is also being lost. 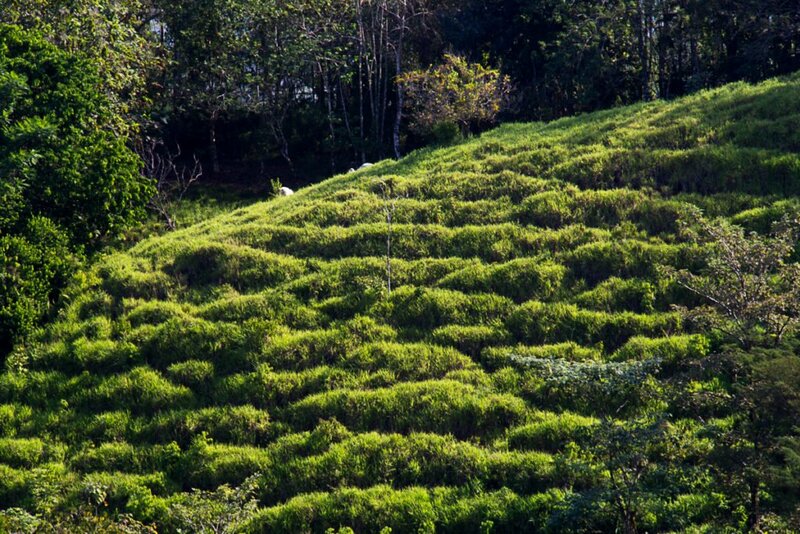 These steep areas, with naturally occurring dense tropical rainforests, harbor agrarian communities and their land-use patterns of development, livestock grazing, and crop production. I was fortunate to be chosen as Conway’s 2016 David Bird International Service Fellow and to experience the hospitality of a country that is the size of Vermont and New Hampshire put together. My goals were to immerse myself in the culture and community of my project site, create a management plan for a 100-acre privately-owned property, and lend my professional photography skills to document the landscape and community. 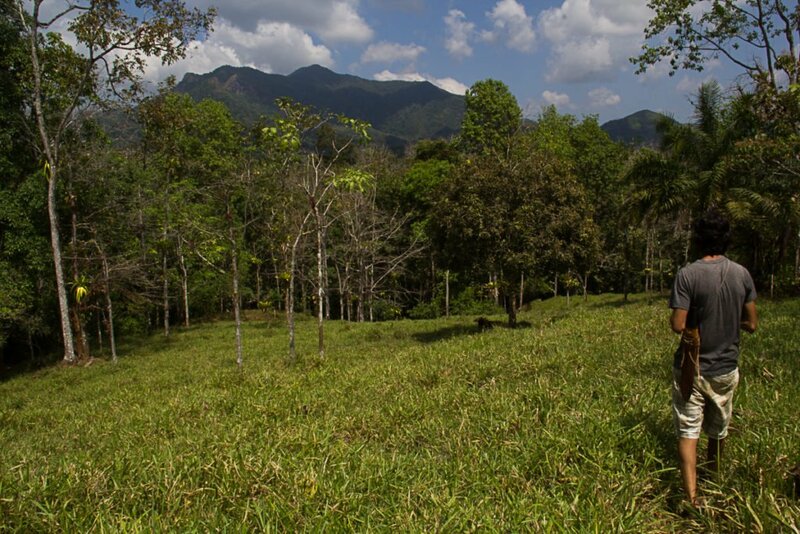 The property, bordered by the area’s main river, Rio Chires, abuts sustainability education center Rancho Mastatal’s private wildlife refuge that borders La Cangreja National Park. A corner of the site lies a stone’s throw from Mastatal, a town of 100 residents within the capital city’s province, and yet two-and a half hours from the capital and major tourist attractions. 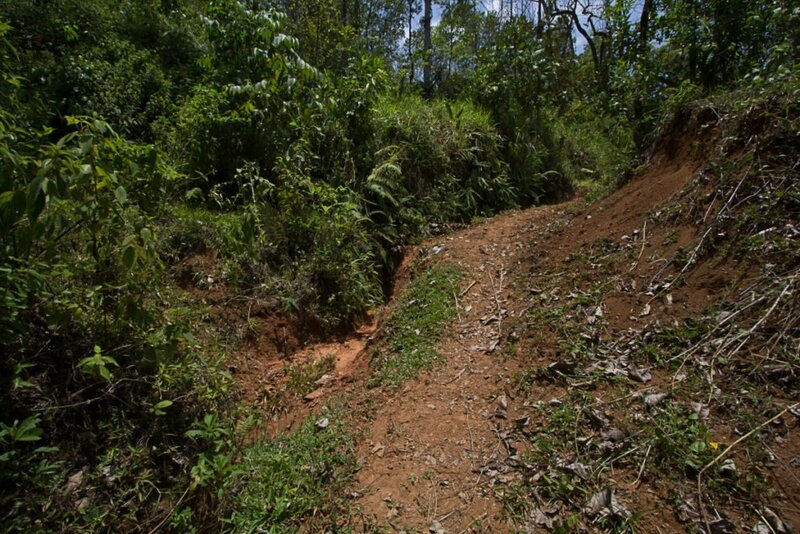 I witnessed rampant erosion on the steep terrain of Mastatal, particularly where livestock trample the vegetation that stabilizes the soil, and along the roads and built environment where runoff channels. The anticipated increase in storm intensity, variability, and intermittent droughts from climate change will result in a higher rate of soil erosion, further affecting the region’s ability to maintain healthy agricultural systems as well as water quality and quantity. The extreme soil erosion I witnessed comes from years of road building, logging, and cattle grazing, all done without implementing measures to limit movement of soil from the impact of pelting rains and overland flow. Installing water bars, regrading roads, planting on contour, and limiting access of cattle to waterways and steeply sloped areas would reduce the loss of soil, increase groundwater retention, and help regenerate biodiverse tropical ecosystems. Perhaps the least publicized problem of climate change is the unmitigated loss of our most underrated natural resource—soil. If we hope to feed the planet, maintain sources of clean drinking water, and support healthy ecosystems in any biome, soil conservation must become the vernacular of all citizens in the 21st century. 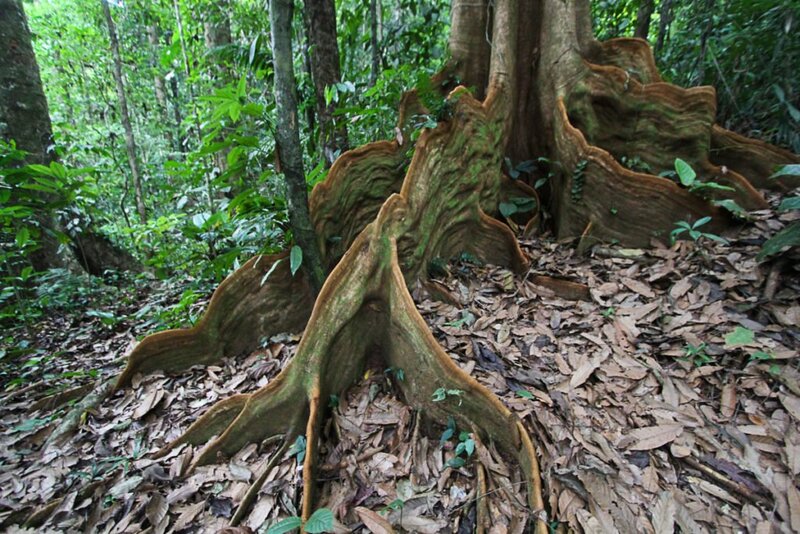 Trees with buttressed roots, such as Ficus spp., abound in the rainforest, as most nutrients in the tropics are available near the soil surface from quickly cycled decomposing detritus. To help support the height achieved by canopy level light competition, shallow rooted tree systems develop buttresses for extra stabilization. 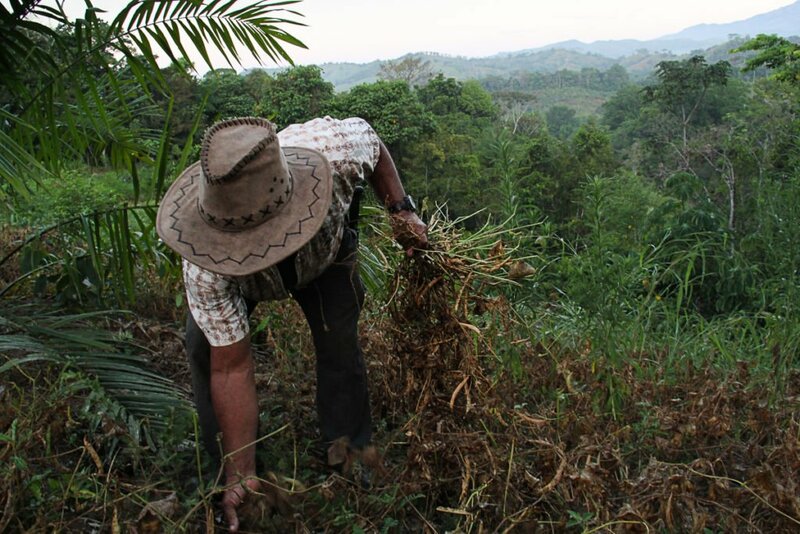 Chepo, a local farmer and employee at Rancho Mastatal, harvests beans on a slope recently deforested for a new palm oil plantation. The owners allowed him to plant between the rows of the newly established orchard. This helps minimize runoff and increases nitrogen fixing for the plantation, and Chepo can use or sell his crop. 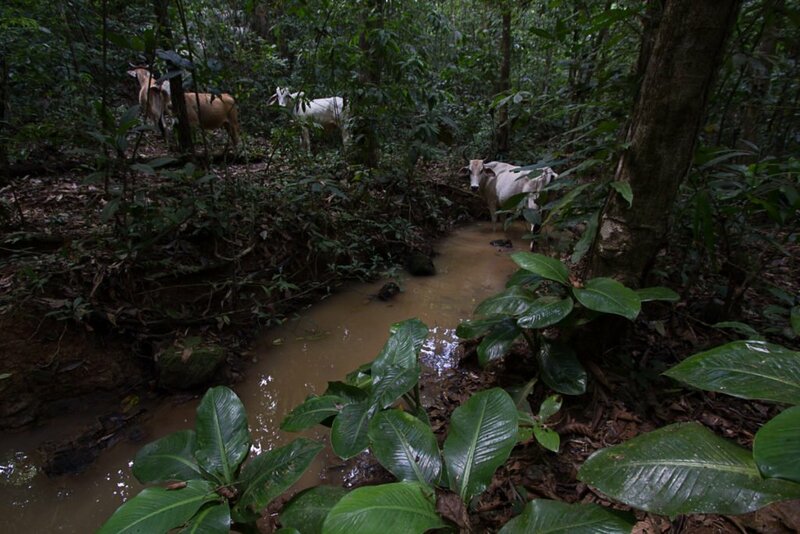 Grazing cows descend deep in the forest to the “quebrada” (stream) to stay cool and hydrate. The presence of cattle in these small streams increases turbidity levels through defecation, disruption of the streambed, and stirring particles already suspended from upland erosion. Patterns of grazing are highlighted in the afternoon sun. Cow paths, worn to topsoil, become rivulets during downpours that find their way down the hill, gaining speed and exposing the roots of vegetation tufts on the downhill edge. The increased height of the stream breaches and falls to the next level, creating systems of cascading mudflows. La Cangreja Mountain and National Park as seen from one of the more gently sloping pasture areas on the project site. Here, Jorge Salazar Garcia, who runs a local chocolate business, leads me on a tree identification tour—there are approximately 2,000 different tree species recorded in Costa Rica. Playa Esterillo Oeste is one of the beaches closest to Mastatal, located 30 miles south. Most local Costa Ricans—known as “ticos” —spend time at the playa and appreciate that property rights in Costa Rica reserve the first 50 meters above the high-tide line solely for public access, in perpetuity. The next 150 meters inland can be leased from the state, but management reverts to municipalities once the lease ends. An eroded property road exhibits long-term effects of mismanaged water runoff. To the left, a gully nearly three feet deep in spots has gouged the road surface. To the right, the exposed soil exhibits incremental loss from the original road cut without vegetation stabilization or appropriate water bar installation. 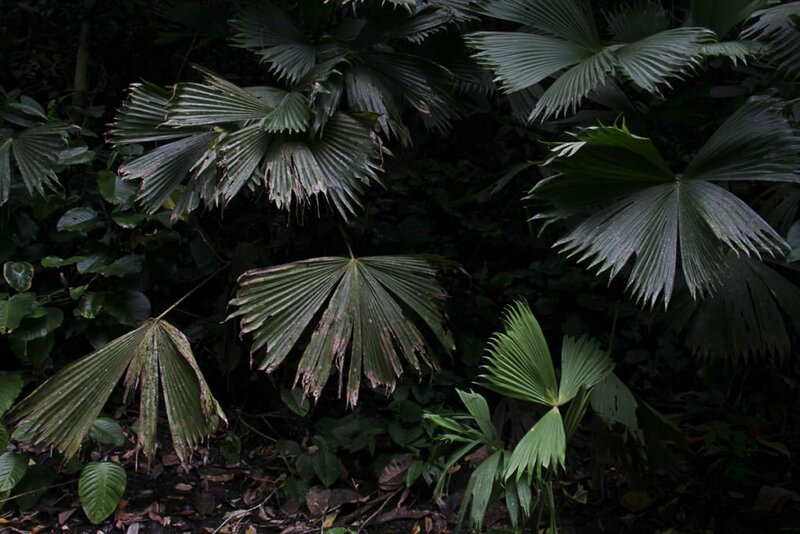 Palma de escoba (Cryosophila warscewiczii) leaves at the edge of the rainforest. The play of light and dark within the native tropical rainforest ecosystem make dramatic chiaroscuro below the understory. 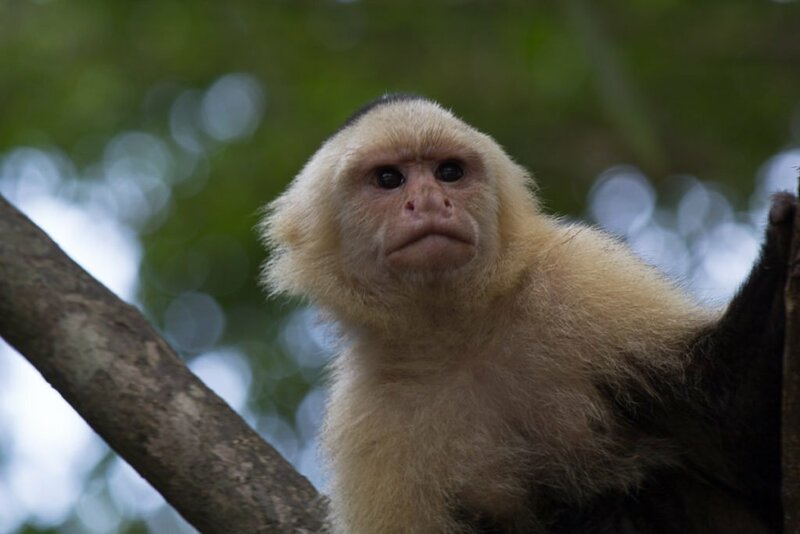 • Capuchin Monkeys travel in the jungle canopy and understory layers and live in small groups (average 15 individuals), foraging from the forest floor to the canopy. One troop of about 10 was seen on the project site. Gioia Kuss (left, at the Río Chires) is a photographer, printmaker, and land-use planner from Weybridge Vermont. The combination of art and science in her academic background informs her images of natural and man-­‐made structures and processes, along with her sense of ecological patterns when working on a land management plan, park, or commercial design. Her photojournalistic style and sensibility and her ability to connect with people were strengthened by her work as a counselor in Vermont communities, which were damaged by severe flooding after Tropical Storm Irene. These experiences drove home how important and vulnerable society is from the effects of climate change and environmental degradation. While firmly rooted in Vermont, she has lived in Paris, Switzerland, and several states across the US. Speaking other languages has helped in her quest to understand different cultural and natural environments while traveling widely. Land Views—Alchemy of Soil, Water and Community, which explores how nature and culture combine to affect the land, and our perception of man’s place in the environment through agriculture and landscape design; and Mastatal—Portrait of a Changing Community that documents a way of life in rural Costa Rica. Gioia received a BA from Middlebury College and an MA from the Conway School of Landscape Design. In addition, she has taught math, science, and art at Ecole d’Humanité an international high school, and Printmaking at Green Mountain College.